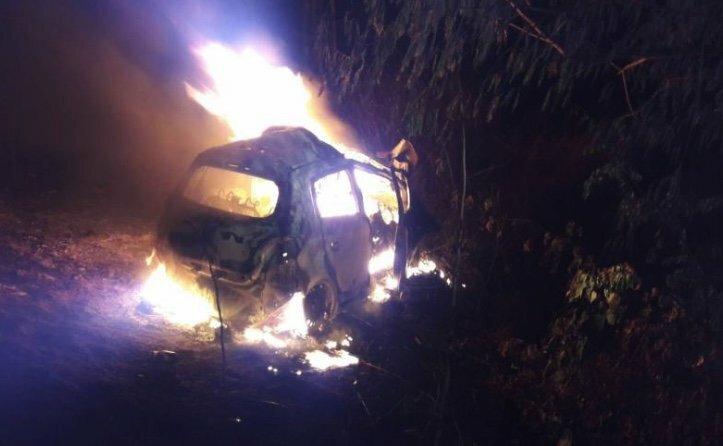 Daily News reported that three people who died after a Mitsubishi Mirage hit a sugar cane truck and burst into flames this morning were all aged 23 and worked at the same store. Police arrived on the scene at 2.45 am. The accident happened on Route 202, Chaiyaphum to Bua Yai between KM markers 13 and 14 heading to Chaiyaphum. Sugar cane truck driver Bunyang Meunraksa, 47, said he had made a delivery to a sugar factory in Korat and was on his way back. Shortly after visiting a gas station he noticed a car coming at considerable speed behind him. He said it hit the back of his vehicle then careered off the road and burst into flames. He tried to help but the doors were locked and he could no nothing. He reported the accident to the police one kilometer away but they were not in time to help. 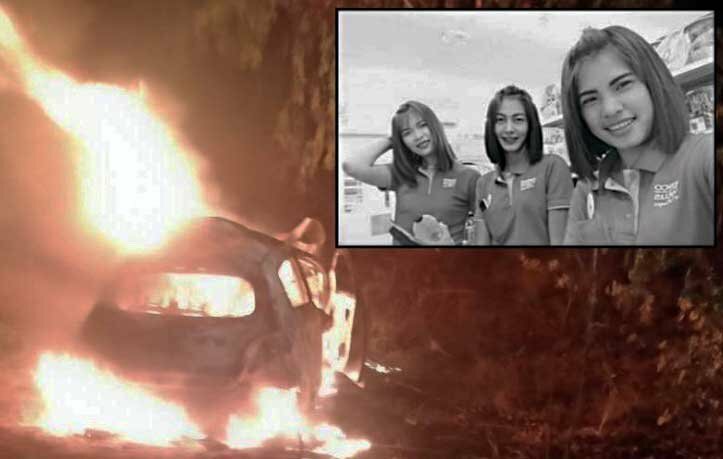 The three occupants of the car were burnt beyond recognition. Daily News later reported they were all 23 and were workers at the same well known store in Chaiyaphum. They were named as Laddawan Phimphila, Sirinnapha Thongtheng and Koithip Luangjampa. Police are investigating where the ladies had been before the accident and are re-interviewing the truck driver. Daily News further reported that relatives of the victims were on their way to pick up the deceased. Sounds a bit odd that a speeding car runs into the back of a truck. Was he turning? I guess he can't say his brakes failed in this instance. Requires further investigation. Unfortunately, another tragedy on the Thai roads. the little car could not avoid this big vehicle that came out under his nose. No taillights or tail lights obscured by low hanging cane. I was thinking the same thing. I see so many of these big trucks with their tail lights out or barely visible because of the low wattage or bad lenses covering them. Could be no or obscured tail lights + the car driver possibly being drunk (coming from a bar at 2:45am?) + possibly texting. I'd check her phone records on that last one. Or, a 'proper' investigation would do that. Not sure it'll happen in this case. Tragic no matter the cause. RIP to the three ladies. If you read the article you will find out he made his delivery to the sugar factory, so it might be possible he was empty? My exact thoughts, if not obscured, then very likely no lights at all. I see them often near Hua Hin with overloads, no lights and driving like mad men. Was the car fitted with LPG ?, so many burn after an accident yet in Australia and most other countries auto shut off valves prevent gas escape. I often wonder about the safety rules for gas fitting and wonder if they are applied by the fitters or checked by anyone. Anyhow that’s another three added to the never ending list , so very sad. I prey they died before being burned alive. Sincerest sympothies to all their families, friends and loved ones. So it was not the fault of himself but always the others! Exactly! All the accident, air-crash, forensics and crime-scene investigators in TVF, together with their superpowers (especially the ability to see and judge without ever being on the site of an incident or have all the relevant info) are so quick to vilify the truck driver. Sure, Thai drivers aren't the smartest of the bunch, but not ALL commercial vehicle drivers are bad. How do we know if the car wasn't speeding? The driver texting, or just distracted, while speeding? Or perhaps they were intoxicated? Who knows? And, all things being equal, even in the dead of the night with zero illumination at the back of the truck, the car would've been able to stop/avoid the truck IF IT WAS NOT SPEEDING and was going at a speed at which it was able to stop within the distance of its headlights' range (defensive driving 101). Even if the truck did pull out in front of the car without looking, the car could still have avoided the truck if it wasn't speeding. Or at least wouldn't have burst into flames. It would take very, very high speeds for the car to smash into it AND burst into flames. Still tragic, no matter how we look at it, but I just think it's too premature to point the finger at any one party at this point.